You can count on our expert guidance in helping you determine your specific cloud requirements. Easy to work with and easily understood, our engineers speak your language: we take the time to explain every step so that you are always part of the process. Migrating to the cloud has many cost and security advantages. Eliminate server and maintenance expense while ensuring your vital data is protected with the most up-to-date cyber security protocols available. Mustard IT provides set-up, maintenance and wrap-around support for all of your cloud needs. We can be as hands-on or as hands-off as needed – it’s all about the way you do business. Access applications, tools and files across all of your devices. Upgrades automatically to ensure you are always running the latest versions. Powerful collaborative tools allow teams to create, edit and share across the network or workgroup. Subscription-based service with no up-front software costs. Plans start as low as £3.10 per user/per month. Robust security features include 128 bit SSL/TSL encryption and more. Recommended for small businesses of up to twenty-five users, Microsoft Office 365 is an entry-level cloud option with many benefits. Office 365 is one of the world’s most popular cloud solutions for small business. Offering the ability to access your company’s files and data from any device, your workforce will enjoy using the Microsoft applications they know and love with the additional advantage of being able to access them from anywhere over an internet connection. Microsoft Office 365 is what is called SaaS, or Software as a Service. Azure goes beyond SaaS to become IaaS (Infrastructure as a Service) and PaaS (Platform as a Service), providing the operating system, computing power and network from which all necessary components are hosted. What does this mean for your business? While Office 365 is a managed solution that is more than enough for many small offices, some may have the need for a more customized approach, more server power and more storage. Azure provides a wide range of integrated services that can accommodate a multitude of operating systems, languages, tools and app development capabilities. With enhanced virtual capacity, Azure is the choice of many when migrating to a cloud-based infrastructure, as it allows for customized business applications and extended mobile app support. This allows businesses to host complex third-party applications as a service to their workforce and customer base outside of the Microsoft ecosystem. Support for a broad range of open-source applications and platforms. Powerful security, compliance and identity management features. Large number of third-party integrations. AWS and Microsoft Azure are players in the same field, though Amazon has been in the cloud computing business for longer. One of the main differences is that Amazon operates almost exclusively “in the cloud” and does not have the same level of support for hybrid deployments as does Azure. On the one hand, AWS provides more attractive options for those working in an open-source environment, such as web developers; on the other, Azure presents a clear advantage for those committed to a Microsoft application workflow. As they are both enterprise-level platforms, the specific features they offer should be your prime consideration when deciding between the two. Are you unsure about which cloud solution is right for you? No two companies are exactly alike, so nor should the solutions they adopt be. We design your cloud infrastructure to suit the way you do business, matching the right technology to your budget and computing needs. 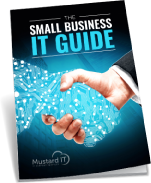 Mustard IT offers several cloud solutions, one of which is right for the way you do business. Moving your operations to the cloud serves the dual purpose of lowering your IT costs and increasing your agility across all business functions. Whether you are building your IT infrastructure from scratch, scaling to meet new growth needs or reimagining your entire IT landscape, Mustard IT’s engineers will work closely with you to conceptualize, design and implement the technology you need to take you into the future. We have independent expertise in all current manufacturers and operating systems and will help you determine the one that is right for you. Working with Mustard IT is like having your own in-house IT professional without the big salary. Our engineers take an individualized approach to every situation and are dedicated to finding the solution that is right for you.